And this, is the review i've been searching for. Maybe they can add this charge test on the next phone reviews. Anonymous, 11 Apr 2015those whom need quick chargers will have their phone's battery die soon.we can afford new batteries. if not, then new phones. 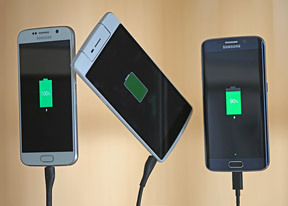 only 10 minutes longer for the note 4 to fully charge over the s6 even though it has a 25% bigger battery. truly impressive. I'm just wondering why my galaxy note 3 charges pretty fast. I'm certainly not complaining. but I guess the galaxy note3 charges faster than the note4 and the s6 duos.is this because of the usb 3.0 that it has? AnonD-185880, 11 Apr 2015I don't need to worry about charging my phone too much, I get nearly 3 days with my 2 year old... moreif it is the original xperia z and not the z1,then you are a liar because the xperia z has one of the worst battery lives ,with regular use you will need to charge it after 6 hours,and i am wondering how can you still living with its horrible camera??!! They should have included the Xperia z series instead of the HTCs as the Zs have two variants of chargers, the other being the magnetic dock which charges almost twice as fast compared to the supplied charger, particularly those of the Z3 series. If you have a Zenfone 2 lying around then why not just review it? I am sure a lot of guys here are waiting for a review. Title is misleading. So you are comparing how fast each handset gets charged, but you aren't using the same charger for the tests. And even if the reviewer did that, he isn't comparing the capacity of the battery (mAh anyone?). Also, there is something that I'm sure didn't even cross your mind; battery capacity wears out after charge cycles; it might not have affected the test if all batteries were new or, almost new. AnonD-185880, 11 Apr 2015I don't need to worry about charging my phone too much, I get nearly 3 days with my 2 year old... moreAll chargers stop charging when it is 100%. Great article , this makes gsmarena stand out once again ! Slower to deplete? Right. Especially with the ultra mega hyper thin prophiles and ultra mega hyper resolution. Still unable to deliver a real 1 day (With whatever) usage. Noob question coming up... So do i get a better charging time if I get a better charger for Asus Zenfone2? If so which one is recommended? Now add skin temperature measurement test during load. I never fail to be flabbergasted by the endurance of these 'Edge' devices. Whenever I see their curved screen I just think how much more juice they must be sapping. How wrong I was! How do they do it??! Hey GSMArena , when are you doing Asus Zenfone 2 review...?